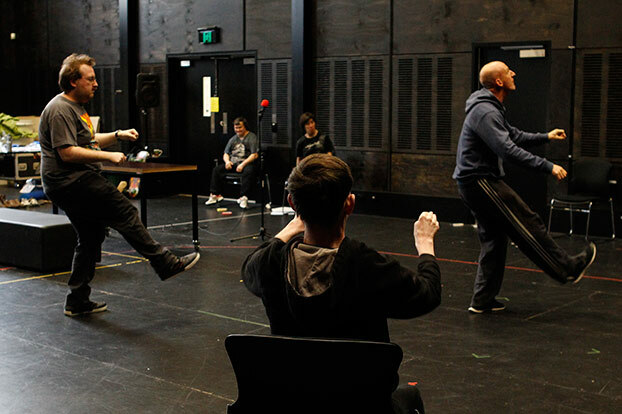 Ahead of Super Discountopening at Wharf 1 Theatre, we talk with its choreographer, Antony Hamilton. What led you to working with Back to Back? Since witnessing Back to Back Theatre's Small Metal Objectsand Ganesh Versus the Third Reich, I had become an avid follower and fan of the company's simply brilliant work. When the director Bruce Gladwin invited me to come on board as a guest artist for Super Discount, I was quick to jump at the chance. What were your initial discussions with Bruce Gladwin about the role choreography would play in Super Discount? What was interesting was that choreography didn't really come into the conversation until well after my first engagement with the company. Initially, I was invited to assess what type of an artist (what artistic discipline) would serve best to create a stage representation of a super hero, so I was the dance auditionee. In turn, that conversation became an early transcript for an initial script to build from, so choreography by chance in a way became a necessary ingredient in telling that story on stage. How do you go about creating the movement from there? Do you bring firm ideas to the room or do you bounce ideas off the performers? The process has been an unusual one for me, in that the dance scenes are fairly representational and referential of dance - as in the scenes actually involve a character who is a choreographer. Therefore, rather than creating the way I would usually, without the necessity for a logical narrative, the choreography must actually take into consideration the building of a character. We need to know if the character is a terribly good choreographer, or a completely terrible one, or something in between. There has been quite a democratic balance between my choreography, and performer-led creative offerings. Choreographers are naturally interested in the untrained body, as it is exciting to watch what is consistently more unpredictable than the trained body. So we see scenes that are both finely tuned, and others more free form and individualistic. What are the differences in working as a choreographer on another company's show as opposed to working on your own dance pieces? Working alone, I have a certain freedom in my practice, in that I utilise dance as a means to express something non-translatable into language. There is great liberty in dance, as it can be the subject of its own investigation, and abstract in terms of its meaning. Each project I work on outside of my own independent works has its own individual needs and, on this one, the dance is illustrative of dance itself, so the content is governed by a greater narrative conclusion that we need to arrive at about the character. That also ends up being the biggest challenge, as the subjective viewpoints of what constitutes a good or bad choreographer are at times at odds with my individual taste! What has excited you about your experience with Back to Back? I've really been excited about the way the company devises the work, and the ensuing outcomes. I found this after the ensemble had done a first reading of the script. Rather than a series of events that inevitably lead you somewhere predictable, Bruce and the cast seem to be able to conjure images much more like life itself - moments compelling in their own right, yet in a way inconclusive, and so demanding that we continue to contemplate them after we leave the theatre. Super Discount, Wharf 1 Theatre, 20 September - 19 October, 2013.